These stained glass windows on the west wall of Michigan State University's Alumni Memorial Chapel depict some of the major fields of learning at MSU. 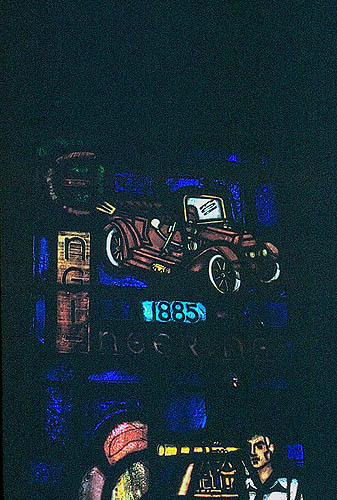 The window above, given by the Class of 1954, documents the founding of the engineering college in 1885 with images of an early automobile, a surveyor, a power line and dam. 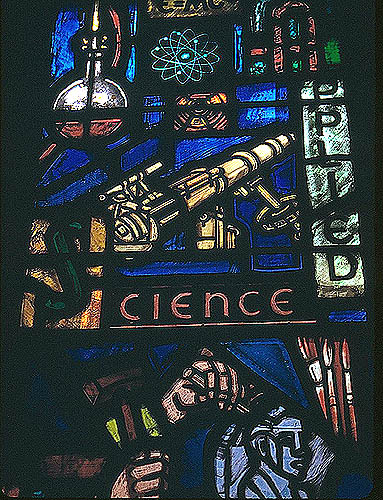 The central window, inscribed 1905, includes images that represent applied science disciplines (laboratory flask, atomic symbol, rocket) and the liberal arts (sculpture, painting, music, literature). 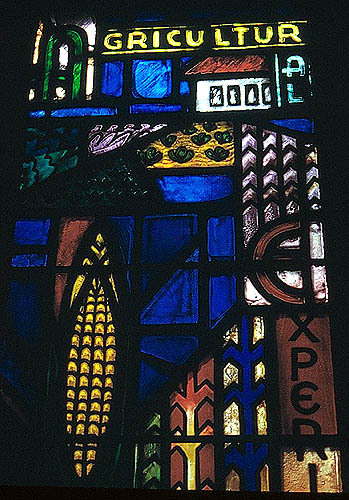 The last window features the Agricultural Experiment Station of 1887, a symbol of the university's dedication to scientific agricultural research and education, with images of planted fields, an ear of corn, growing wheat, and a prize-winning bull bedecked with its blue ribbon. The last two windows were donated to the chapel by the parents of 1954 graduates. The thirty-eight chapel windows were created by the Willet Stained Glass Studios of Philadelphia and were designed by three of Willet's leading designers: Marguerite Gaudin, Anthony Mako and Odell Prather (1912-2001), who designed the above windows and several others in the chapel. Born in Kansas, Odell "Billie" Prather studied art at the Philadelphia College of Art and the Art Students League of New York. Her early work was as an illustrator for children's magazines. She was a designer with the Willet studios from 1951 until the 1960s, when she began her own freelance design studio. Prather also worked as a sculptor, having studied sculpture at Temple University's Tyler School of Art. The chapel itself, designed by Ralph H. Calder in the Collegiate Gothic style, was built with alumni contributions in 1952 as a memorial to MSU students and alumni who served or died in the United States armed forces. The names of those who died while in military service since 1861 are listed on its vestibule walls. The chapel is used frequently for private meditation, weddings, memorial services and religious ceremonies for people of all faiths. See http://www.hfs.msu.edu/union/services/alumni_chapel.html for an exterior view of the chapel. The year 2005 marked the 150th anniversary of the founding of Michigan State University in 1855 as the Agricultural College of the State of Michigan. With President Lincoln's signing of the Morrill Act of 1862, it became the nation's pioneer land-grant university. The Alumni Memorial Chapel and its windows form an important part of the history and traditions of Michigan State University. The Sesquicentennial year has been filled with special events to commemorate this significant anniversary. A landmark exhibition at the MSU Museum, entitled "Memories of MSU," draws from various collections to focus on two main themes: "The Growth of a Great University" and "The World is Our Campus." The Alumni Memorial Chapel was registered in the Michigan Stained Glass Census by Bill Heater of Lansing. Stanford, Linda O. and C. Kurt Dewhurst. MSU Campus Buildings, Places, Spaces: Architecture and the Campus Park of Michigan State University (East Lansing: MSU Press, 2002). Text by Betty MacDowell, Michigan Stained Glass Census, May , 2005.